Amie Street is one of those startups that just got me – love at first site if you will. I first discovered them in 2006, calling it an awesome new music model. Artists upload songs and those songs are free to download to start. As more downloads occur the price goes up. A cent, fifty cents, etc., up to $1. The price of the song is an indication of how good it is, as friends share the good stuff with others. Over time a lot of artists tried out the service, songs were downloaded over 10 million times, and the company raised venture capital from Amazon and others. And today, the company will announce that Amazon has acquired the Amie Street business. Going forward the team will focus on Songza, which they acquired in 2009. 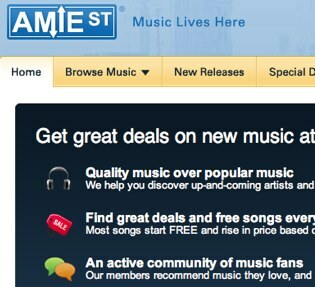 Amazon will redirect Amie Street to a new cobranded Amie Street/Amazon Music Service site and give users a $5 coupon to purchase songs on Amazon. But while the users and the brand are being acquired, Amazon will most likely ditch the business model, say the founders (stressing that they don’t know for sure). Much like imeem’s acquisition by MySpace, this is more of a traffic acquisition than anything else. The terms of the deal aren’t being disclosed. The team seems bullish on Songza, which lets users create custom playlists/radio stations and share them with friends. Since relaunching less than a month ago 20,000 stations have been created and some users are listening for an average of half an hour at a time. Here’s a station that Yelp employees in Miami created, for example. RIP Amie Street. I once had you on the list of products I couldn’t live without. Somehow, I’ll have to find a way to move on. And I’m looking forward to seeing how Songza evolves.